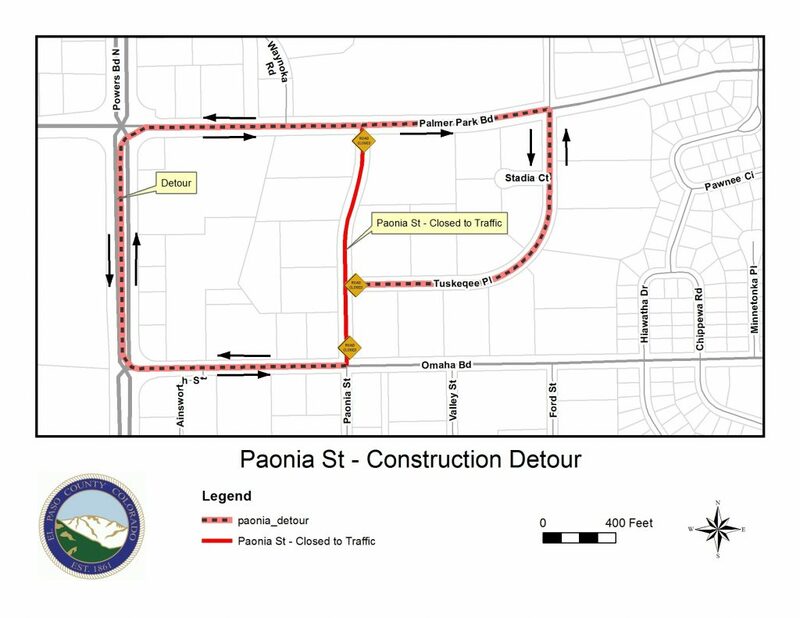 El Paso County Public Works has contracted with Martin Marietta Materials and Asphalt who will be paving Paonia Street from Palmer Park Boulevard through Omaha Boulevard. Weather permitting, the project is scheduled to begin the week of Aug. 20 and is expected to take about two weeks. Palmer Park Boulevard, Powers Boulevard, Tuskegee Place and Omaha Boulevard will serve as the detour route during the closure. Drivers are encouraged to take alternate routes during construction. Drivers who need to use the detour routes should plan for added travel time through this area. The closure will alternate with a northbound lane closure utilizing the southbound lane to maintain access to all businesses in the area. The closure will then be switched to the southbound lane using the newly paved northbound lane for access. Drivers are reminded to reduce speeds and to watch for workers, equipment, signs and barricades. El Paso County wishes to thank drivers in advance for their cooperation. Road closures will accelerate the safe and efficient completion of this project. Funding is provided through the Pikes Peak Rural Transportation Authority.